The LM1 DF53 has a 53cm / 21” cutting deck width and features a front-wheel-drive self-propelled drive system to take the effort out of pushing the lawnmower around the garden. Mulching optimises the nutrient cycle of the lawn, when the grass is cut several times and then equally distributed onto the ground. There it can be used as a natural green fertiliser. The LM1 DF53 is a 2-in-1 function push mulching lawnmower with a Cub Cadet 55 OHV engine providing the power to cut up to 1,200 m2/h. The cutting height adjustment ranges from 35-100mm and can be selected through 9 stages. 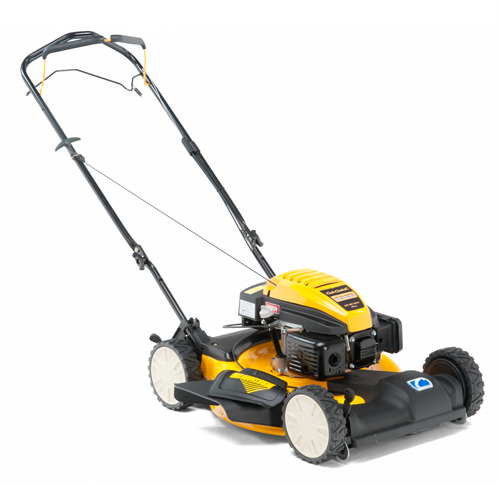 Another benefit of this mulching lawnmower, is that there are no grass clippings to be disposed of when you have finished mowing.